The National Court Reporters Foundation recognized long-time NCRA member Rosalie Kramm, RPR, CRR, San Diego, Calif., with the 2017 Santo J. Aurelio Award for Altruism. The award was presented to Kramm during the Awards Luncheon on Aug. 12 at the 2017 NCRA Convention & Expo, held in Las Vegas, Nev. The Santo J. Aurelio Award is given to a working court reporter with more than 25 years of experience who has given back to the profession and to the court reporting community with no expectation of any reward. Kramm began her career as a court reporter in 1981 working for Robinson & Vint Court Reporters. In 1985, she opened Kramm Court Reporting. According to comments submitted by those who nominated her, Kramm is regarding in the profession for her professionalism, willingness to help, and love of promoting the profession. Nominations are now being accepted for the Santo J. Aurelio Award for Altruism, the highest honor awarded by the National Court Reporters Foundation. The deadline for nominations is July 7. The Aurelio Award, which is presented at the NCRA Convention & Expo, is bestowed on a long-time court reporter who has given back selflessly to the profession or community. The nominee must be an NCRA Participating or Registered member or a Retired Participating or Registered member, have demonstrated altruistic behavior, and have been a working reporter for at least 25 years. 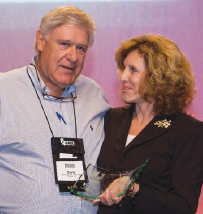 “For me, being recognized by my peers was and continues to be a professional highlight,” said Pat Graves, FAPR, RDR, CRR, CRC, a CART captioner and firm owner from Monument, Colo., and the 2016 Aurelio Award recipient. “To hear the heartfelt words of people I work with and serve is both humbling and startling! I always think I fly under the radar and that no one notices me or what I do,” Graves said. 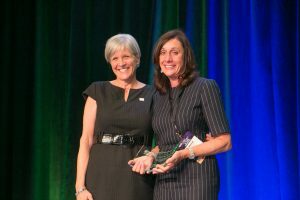 “It is with dedication and care that one’s peers send in a nomination and then do all the follow-up work required for this award or really any award bestowed upon NCRA members. I encourage my colleagues to please consider nominating someone you know for this award. You never know how much it will mean to them,” she added. For questions or more information about the Santo J. Aurelio Award for Altruism, contact B.J. Shorak, NCRF Deputy Executive Director, at 800-272-6272, ext. 126, or at bjshorak@ncra.org. Nominations are now being accepted for the Santo J. Aurelio Award for Altruism, the highest honor awarded by the National Court Reporters Foundation. The deadline for nominations is July 6. 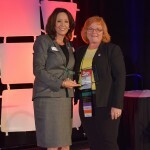 The Aurelio Award, which is presented each year at the NCRA Convention & Expo, is bestowed on a long-time court reporter who has given back selflessly to the profession or community. The nominee must be an NCRA Participating or Registered member or a Retired Participating or Registered member, have demonstrated altruistic behavior, and have been a working reporter for at least 25 years. “I struggle greatly to find words sufficient to describe the sense of vindication this award has provided me. I guess as appreciation for all that reporting has given my family and me, for nearly 55 years I have tried to give back by helping students and colleagues – although often in the face of apathy, even criticism. Receiving the Aurelio Award for Altruism has provided solace that I have been doing the right thing, and for the correct reasons,” said Dom Tursi, CM, an official court reporter from Central Islip, NY., who was honored with the Aurelio Award in 2015. 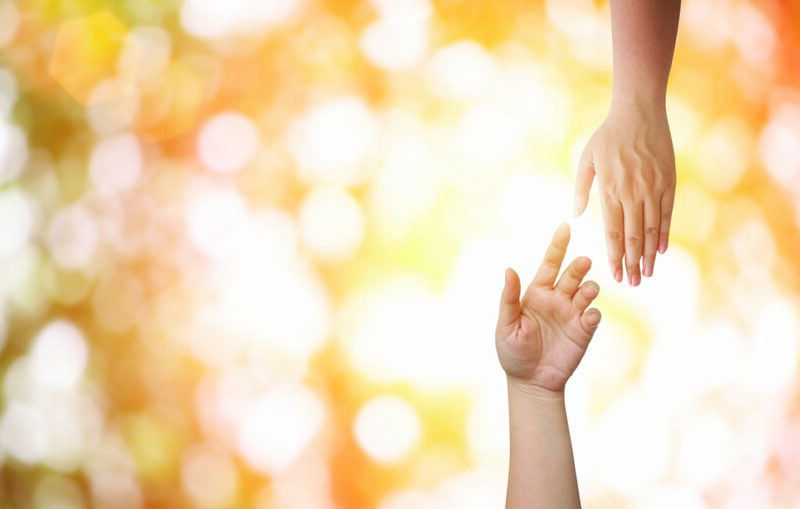 “In the life of a professional, few things are as meaningful as receiving peer recognition. Humbled, honored, vindicated – these descriptors best convey my heartfelt reactions when I received NCRF’s Aurelio Award. That this group of extraordinarily compassionate people chose me was truly humbling. Knowing that among these were some of our finest, most accomplished professionals made me proud to be so honored. At least on par with these feelings is a sense of knowing that my steno notes of life have been clear and accurate,” he added. Long-time NCRA member Dom Tursi, CM, was named recipient of the Santo J. Aurelio Award for Altruism during a special awards luncheon held at the Association’s 2015 Convention & Expo held July 30-Aug. 1 in New York City. Members of the 2015 class of the Academy of Professional Reporters, NCRF intern scholarship winners, and Bonni R. Shuttleworth, CRI, CPE, recipient of the 2015 CASE Award of Excellence, were also honored at the luncheon, along with Josephine Nosker, Tracey Tracy, Angeli English as the winners of the CASE essay scholarship. The award is presented by the NCRF and is given to a working court reporter with more than five decades of experience who has given back to the profession and to the court reporting community with no expectation of any reward. Tursi, an official court reporter from Central Islip, N.Y., has worked as a freelance reporter, an official court reporter, and a videographer. 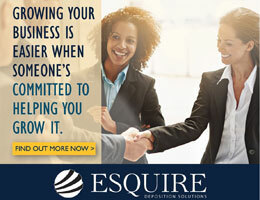 He has also been a partner in a firm, opened his own firm, founded a court reporting school, taught court reporting, provided closed captioning for clients, and reported proceedings in at least a half-dozen countries. Tursi is also the author of a number monographs and has served in many capacities at the local, state, and national levels, logging thousands of volunteer hours on behalf of court reporting. A long-time supporter of the profession and students, he has shared his expertise as a seminar presenter for his state association and law firms, and as a lecturer and mentor to countless students. He is also a national and multi-state winner of numerous speed contests in Literary, Legal Opinion, and Q&A, and has also provided live dictation numerous times for NCRA for the RPR and other tests. As part of NCRA’s People to People program, he served as an ambassador to China in 2007 and is credited with creating a true respect between the American and the Chinese court reporting communities. In September 2010, he opened the Gallery of Shorthand in his own courthouse, a museum-like venue that showcases the history of the court reporting profession. The museum and its collection of artifacts are considered to be that of Smithsonian quality. Maybe you’re like I was a few years ago: Familiar enough with the National Court Reporters Foundation to know it did good things — isn’t that what foundations do? — but not quite familiar enough to be able to list three reasons why I was an Angel, which is a donor who supports the Foundation with an annual donation of at least $1,000. Or maybe you’re someone who has heard the acronym NCRF but never really knew what it was all about and, therefore, never felt particularly compelled to support it with your time or resources. Well, either way, I’m here to deliver a message: Your Foundation wants to be your new best friend! Like best friendships, reciprocity is always a cornerstone. Any one-way street usually dead-ends at some point. But relationships where you both give and get back seem to be the most rewarding. NCRF supports students and new professionals. We’ve all been there, and it goes without saying that the scholarships, grants, and complimentary NCRA memberships provided by NCRF are credibly needed and appreciated by the future of our profession: court reporting students. The Veterans History Project and the Legal Education Program are two NCRF initiatives that stand on their own in terms of the value they add to our communities. 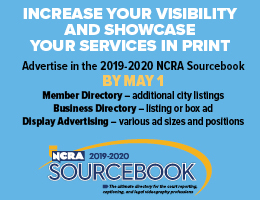 But the extra value they add to NCRA members through the awesome marketing opportunities they create is definitely underestimated and underleveraged. Also, did I mention you can obtain free PDCs by participating in these programs? 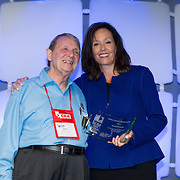 Each year, through the Santo J. Aurelio Award for Altruism, NCRF recognizes and honors one outstanding court reporter at the Annual Awards Luncheon at convention whose altruism throughout his or her service to our profession has been extraordinary and exemplary. Always powerful and moving. And hot off the press: As a result of a recent strategic planning session NCRF is creating new and exciting tools and initiatives for court reporters to use not only in marketing themselves and their firms but also in touting the profession as a whole. As you can see, NCRF creates and supports projects and programs that support court reporters, our profession, and our communities. Pretty noble work, right? What’s not to love? And it is all made possible by the financial support of NCRA members and other generous donors. So, here’s to the engagement of every member with NCRF and to a long and prosperous relationship rooted in mutual support. 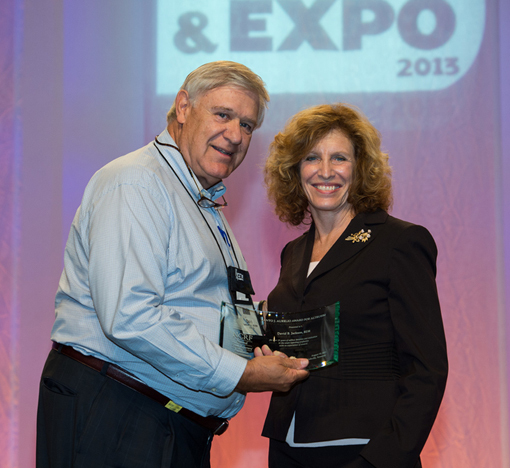 David Jackson, RDR, from Dallas, Texas, received NCRF’s 2013 Santo J. Aurelio Award for Altruism during NCRA’s Convention & Expo in Nashville, Tenn. Jackson is a principal with the United American Reporting Services in Dallas. He is the 15th recipient of the Aurelio Award. Jackson, who served six years in the U.S. Naval Reserve, including one active year as a court reporter at the Naval Guided Missile School at Dam Neck, Va., began his court reporting career as a freelancer in Oklahoma City. In 1971, he joined the firm of Federal Court Reporters and continued service with the company after it merged with United American Court Reporting Services in 1986. Jackson is regularly involved with organizations at the local level and holds membership in the Dallas County Shorthand Reporters Association. He served as its president in 1979. At the state level, he is a member of the Texas Court Reporters Association and served as president of the group from 1983 through 1984. He is a past recipient of TCRA’s Distinguish Service Award and is a member of the organization’s Hall of Fame. Jackson holds membership in NCRA and served on the organization’s board of directors from 1998 through 2001. He is also a member of the Society for the Technological Advancement of Reporting and a founding member of Legal Image Network Communications, serving as its vice president and treasurer in 1991. During his career, Jackson served two terms on the Texas State Bar Association’s Unauthorized Practice of Law Committee. He was a member of the advisory committee for the Court Reporting Institute of Dallas and the Professional College of Court Reporting. He was also appointed by the Texas Supreme Court to the Texas Court Reporters Certification Board and served seven years as co-chair of the Testing Committee, dictating and administering the Texas CSR test for court reporting. He has served as member of the Texas Supreme Court Advisory Committee since 1992. His articles have appeared in the Texas Trial Lawyers Forum and in TCRA’s Texas Record, and he has been a presenter at numerous NCRA and TCRA meetings. In addition to being involved in professional organizations, Jackson is a member of the Park Cities Baptist Church in Dallas and was involved with the local Big Brothers program from 1980 through 1987. The Aurelio Award is the highest honor bestowed by the National Court Reporters Foundation, the charitable arm of NCRA. The award is bestowed each year to one individual in recognition of their commitment to the court reporting profession and for their selfless actions to give back to the community. David Jackson (left) is Presented the Aurelio Award by NCRF Chair Merilyn Sanchez (right). NASHVILLE, Tenn., Aug. 13, 2013— The National Court Reporters Foundation (NCRF), the charitable arm of the National Court Reporters Association (NCRA), the country’s leading organization representing stenographic court reporters and captioners, announced today that veteran court reporter David Jackson, RDR, from Dallas, Texas, was named recipient of the 2013 Santo J. Aurelio Award for Altruism, the foundation’s highest honor, during NCRA’s 2013 Convention & Expo held in Nashville, Tenn., Aug. 8-11. The award is bestowed each year one individual in recognition of their commitment to the court reporting profession and for their selfless actions to give back to the community. Nominees must be an NCRA Participating, Registered, Retired Participating, or Retired Registered member; must have demonstrated altruistic behavior; and must have been a working reporter for at least 25 years. Jackson, a court reporter with more than 40 years of experience, is a principal with the United American Reporting Services in Dallas, Texas. He is the 15th recipient of the Aurelio Award. Jackson, who served six years in the U.S. Naval Reserve, including one active year as a court reporter at the Naval Guided Missile School at Dam Neck, Va., began his court reporting career as a freelancer in Oklahoma City. In 1971, he joined the firm of Federal Court Reporters, and continued service with the company after it merged with United American Court Reporting Services in 1986. He holds the professional designations of Certified Steno Reporter (CSR) from the state of Texas, as well as the NCRA-recognized Registered Diplomate Reporter (RDR), and certificates of Proficiency and Merit. Active at the local level, Jackson holds membership in the Dallas County Shorthand Reporters Association and served as its president in 1979. At the state level, he is a member of the Texas Court Reporters Association (TCRA) and served as president of the group from 1983 through 1984. He is a past recipient of TCRA’s Distinguish Service Award, and is a member of the organization’s Hall of Fame. At the national level, Jackson holds membership in NCRA and served on the organization’s board of directors from 1998 through 2001. He is also a member of the Society for the Technological Advancement of Reporting (STAR), and a founding member of Legal Image Network Communications, serving as its vice president and treasurer in 1991. During his career, Jackson served two terms on the Texas State Bar Association’s Unauthorized Practice of Law Committee, and as a member of the Advisory Committee of the Court Reporting Institute of Dallas and Professional College of Court Reporting. He was also appointed by the Texas Supreme Court to the Texas Court Reporters Certification Board, and served seven years as co-chair of the Testing Committee, dictating and administering the Texas CSR test for court reporting. He has served as member of the Texas Supreme Court Advisory Committee since 1992. Active in his community, Jackson is a member of the Park Cities Baptist Church in Dallas, and was involved with the local Big Brothers program from 1980 through 1987. His articles have appeared in the Texas Trial Lawyers Forum and in TCRA’s Texas Record, and he has been a presenter at numerous NCRA and TCRA meetings. Jackson resides in Dallas, and enjoys coin, stamp, art, and gun collecting, as well as golfing, fishing, hunting, and sailing. “David is one of my local friendly competitors, and he is a big man with an even bigger heart,” said Donna L. Collins, RPR, CRR, CCP, owner of Collins Realtime Reporting, in Dallas, who nominated Jackson for the award. “He received the Texas Court Reporters Association top honor, the Distinguished Service Award, 18 years ago and now deserves the Auriel award. He continues to serve on the Texas Supreme Court committees, proctoring and grading court reporter exams, as well as testifying before the legislature, speaking at seminars, and mentoring others in and outside of the court reporting profession. Dr. Santo J. Aurelio, a former court reporter for 30 years, earned a bachelor and master degree from Harvard Business School, and a doctorate in education from Boston University. He is a visiting professor at colleges throughout the Boston area, where he teaches a variety of subjects, including English grammar and medical legal terminology. He has written extensively on Black English, Judeo-Christian religion, sexist language, classical art, discrimination, word etymology, adult basic education, Jewish and Italian immigration, legal terms, and mnemonics. Most of his time is spent teaching, engaging in research and writing. He has four sons, and lives with this wife of more than 50 years in Arlington, Mass.